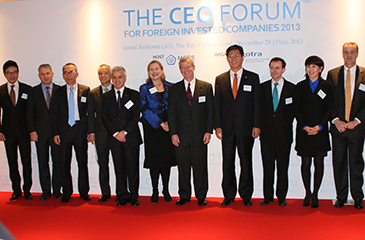 “The 8th CEO Forum for Foreign Invested Companies 2013” being held at the Ritz-Carlton Hotel in Seoul on Nov. 28, 2013. 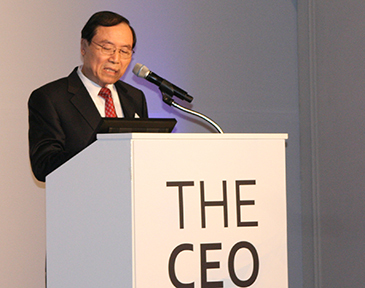 “The 8th CEO Forum for Foreign Invested Companies 2013” was held with some 200 presidents and top executives of foreign companies in South Korea at the Ritz-Carlton Hotel in Seoul on Nov. 28, 2013. 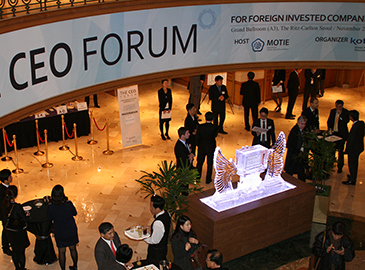 The forum aimed to improve the investment climate and aftercare services for foreign invested companies in South Korea. The event, organized by the Korea Trade-Investment Promotion Agency (KOTRA), was anticipated for its networking opportunities and clarifications on the existing economic policy decision-making process. Among the guests were several prominent foreign envoys serving in Seoul including German deputy head of mission Johannes Regenbrecht and French Ambassador to Seoul Jérôme Pasquier. The opening remarks were delivered by Vice Minister Kim Jae-Hong of Industry and Technology at the Ministry of Trade, Industry, and Energy. Boeing Korea President Patrick Gaines (7th from left) poses with French Ambassador to Seoul Jérôme Pasquier (3rd from right), and other foreign CEOs. Director Yoon Sun-Hee of the Bureau for Economic Regulatory Reform at the Prime Minister’s Office, covered regulatory reforms in Korea. He stressed that the government continuously strives to enforce the legal validity of all existing and upcoming legislations. Yet, non-discrimination regulations to protect domestic and foreign companies only remain a “recommendation” and are not enforced by the rule of law. Director Kim Jong-Min of the Immigration Policy Division at the Ministry of Justice, elaborated on the current state and goals of Korea’s immigration policy. He concluded that Korea needs to attract more qualified foreign immigrants to balance the ageing population. At the same time, he underlined the government’s continuous crackdown on unqualified and illegal immigrants. Mr. Ahn Choong-Young, a foreign investment ombudsman of the Korea Trade-Investment Promotion Agency (KOTRA) speaks. This was followed by a talk on Korean culture by Bradley Kent Buckwalter, president and regional general manager at ADT Korea. On a lighter note, he focused on the generosity of the Korean people and sprinkled his talk with personal anecdotes. Ahn Choong-Young, a foreign investment ombudsman, talked about recent accomplishments and challenges facing Korea’s economic future. Considering that 80 percent of current FDIs are sourced from re-investments, he stressed the need to attract new foreign investments to maintain a stable balance sheet. The evening was concluded by a gala dinner and magic show by a local magician.